iDancehallReggae.com::Caribbean Lifestyle Media::: Serani to take over Brooklyn! Serani to take over Brooklyn! On Wednesday, October 28th, Dancehall's latest pop-sensation Serani will celebrate the release of his debut album No Games with Brooklyn's top-rated selector (DJ) Steelie Bashment and hundreds of Brooklyn fans at Club Temptations. The ever-popular weekly Dancehall-centered party Waah Gwan Wednesday will be the backdrop of Serani's official Brooklyn album release event. 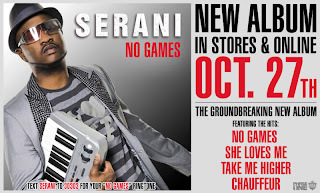 No Games comes on the wave of the huge success of Serani's international hit single of the same name.The record has enjoyed incredible momentum with multi radio formats including Urban AC, Urban, Rhythmic and Top 40 radio, earning over 30,000 spins. The video for "No Games" is in regular rotation on BET, BET J, MTV Jams, MTV U, MTV2, VH1's "Island Soul" and Music Choice "Hit List" on demand, where it receives 30,000 views per week from May - July of this year. No Games will be available in stores and on iTunes on October 27th. "Serani is definitely one of the biggest Dancehall pop-sensations in the U.S., especially in New York," states Steelie Bashment. "He has been to Waah Gwan Wednesday a couple of times before, and each time was pandemonium. His Brooklyn fans are definitely excited about the album, and will most definitely be at Waah Gwan Wednesday for the release party." Always on the cutting-edge of Dancehall style, culture, and music, Waah Gwan Wednesday is one of the most talked about weekly events in New York City, and Brooklyn's signature outfit for the latest and greatest in Dancehall and Caribbean music. Named for Steelie's Internet Radio station Waah Gwan Radio, the event has attracts hundreds of patrons weekly, and has featured guest DJs like Hot 97's Cipha Sounds, Mister Cee, and Funkmaster Flex, Power 105.1 FM's DJ Self, Tony Matterhorn, Gary Chucks, and Coppershot. Past attendees include Dancehall deejays Demarco, Charly Blacks, Lexxus, and Erup, Reggae singers Gyptian, Alaine, Sugar Minott, and Pressure, and super producer Don Corleone. Waah Gwan Wednesdays' No Games Album Release Party will be held at Club Temptations (2210 Church Avenue) in Brooklyn, NY on Wednesday, October 28th.